Just because you're on a road trip doesn't mean you have to stop at chain restaurants along the way. Granted you probably want something quick so you can get back on the road, there are other options besides the "Golden Arches." If you're looking for breakfast (any time of the day), lunch, or dinner- and a side of nostalgia- you'll find it at Moe's-almost famous- Diner. 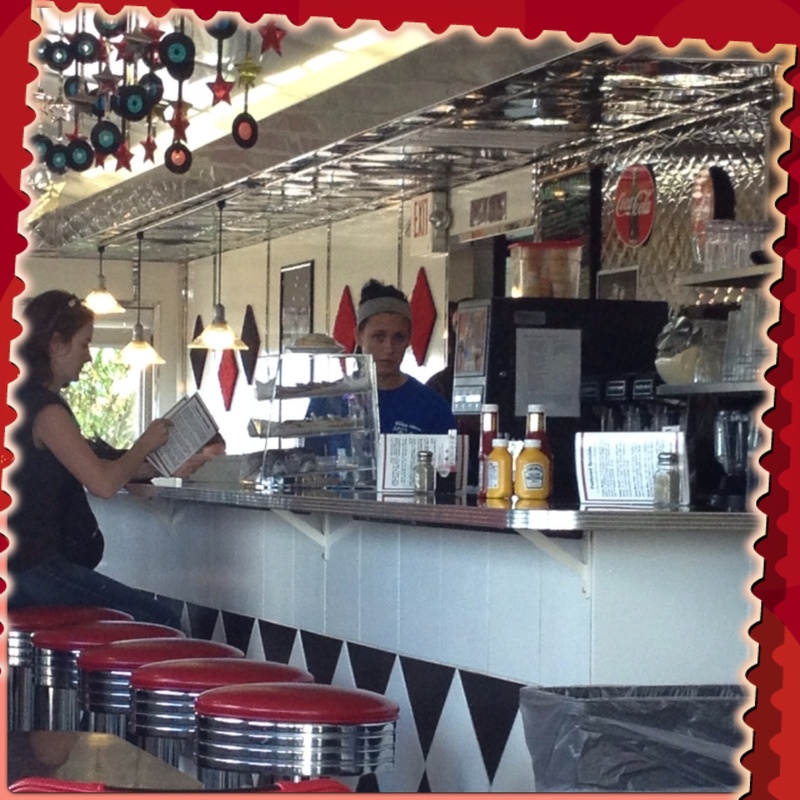 You know this retro 50's diner is a favorite just by the parking lot: motorcycles, four-wheelers, mini-vans, and classic cars. Moe's is a welcome sight for road-trippers and locals alike. Though you can linger over a cup of coffee and the newspaper all morning, their food is served fast if you're hoping to back on the road quickly. We all chose lunch options this time: California Dreamin' Burgers, Hot Diggity Dawg, and I had the 'Lil Rascals Club House Wrap. But the kids beg to stop here for another reason. 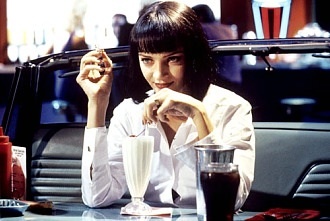 "You think I could have a sip of that?...I gotta know what a $5 milkshake tastes like." It's not an easy feat, but I try to get them to agree on one flavor, since these milkshakes are HUGE! Not only do you get the huge shake glass, they serve it with an almost-full metal shake container- like any good diner should! Unfortunately, unless you're driving to Northern Wisconsin you'll have to drive several hours to get to Moe's. 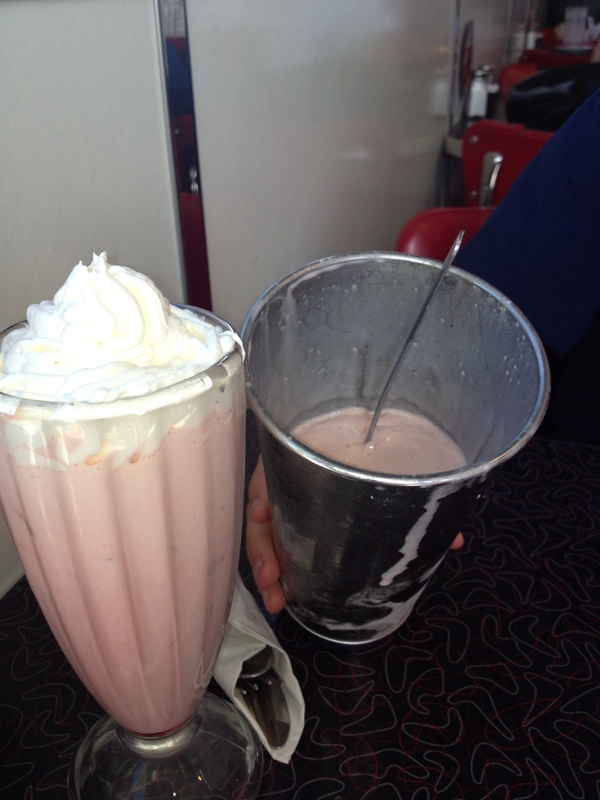 If you're looking for a milkshake fix a little closer to home- try Franks Night Out. They were out of pumpkin puree for their pumpkin shake (very cool that he offered to go to the store to get more for me! ), so I went with their Banana Nutella Pretzel Shake. Seriously? Yum! What's your favorite milkshake combination?